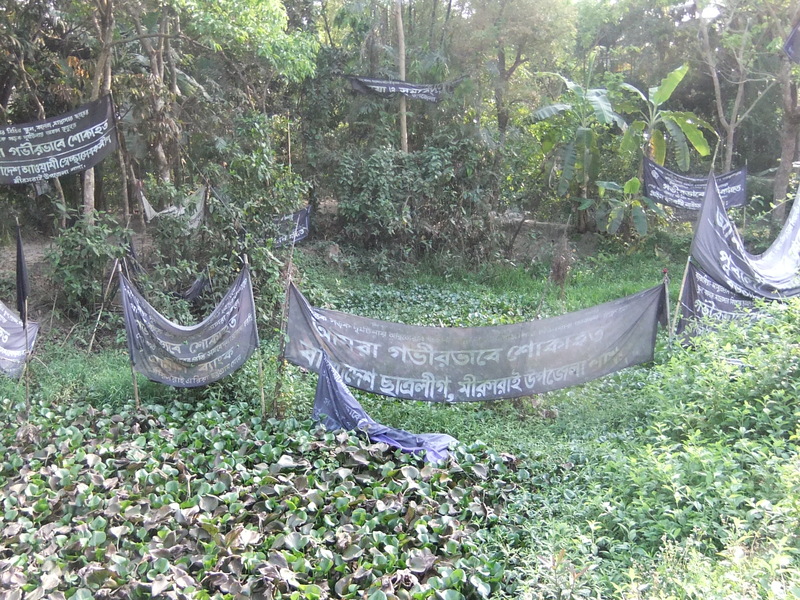 My recent trip to Bangladesh was very full and complex as are often in the nature of these trips. This trip however, had a little more complexity to it, than in my previous visits, in that it included a trip to the small village of Mirsarai to do anti bullying work using art, and Playback and not only did that but also continued grief and trauma work with a community that had experienced a horrendous disaster of losing 45 boys after a futball game last year. Working with my Bangladeshi colleagues (Reza Aziz and Nila Farzana) we created a team of 15 wonderful and multi skilled people. It truly was an eye opening and heart opening experience I think for all of us. And many of you supported me in this endeavor for which I am very grateful. With your financial support, I was able to defray my trip costs. THANK YOU! These trips are not inexpensive, as I am sure you are all aware! 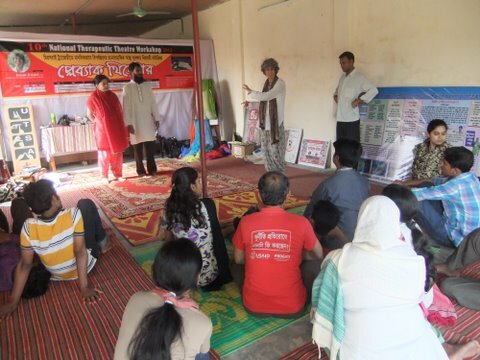 Considering that at that exact time, there were rallies around a meeting that the Opposition to the Government were having in Dhaka, this workshop was well timed and well used!! (For the first day, there was no public transportation allowed except for bicycle rickshaws) – There were very real concerns over potential violence in the city- particularly near us, as the DU students were also protesting the government. We discussed this at length in our workshop. The benefits of course was that the commuting time for all was cut in half or even more. Many stores closed and no one was going to work! Musical instruments were hard to come by for this workshop. 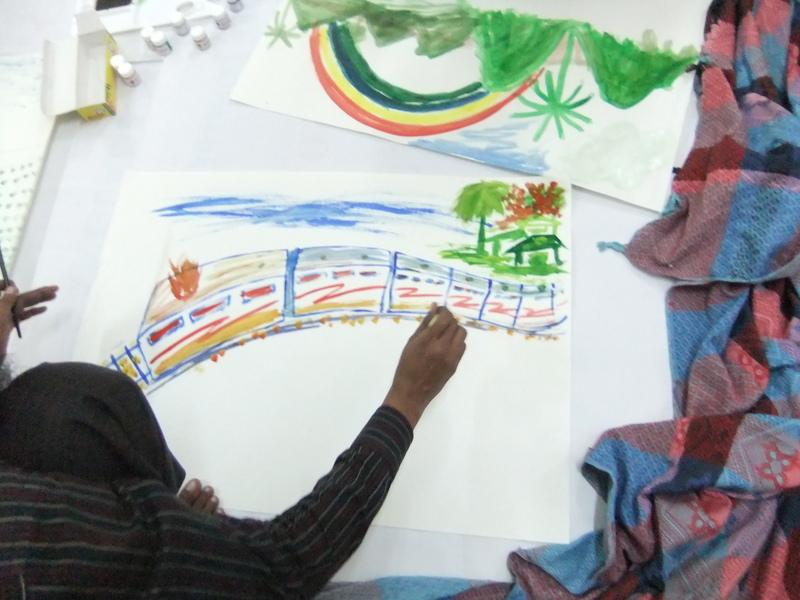 So participants improvised in very creative ways. Key sets, water glasses water bottles and sticks made for very interesting sounds to complement the tambourine and drums. Journal writing is an important aspect of Expressive therapies. 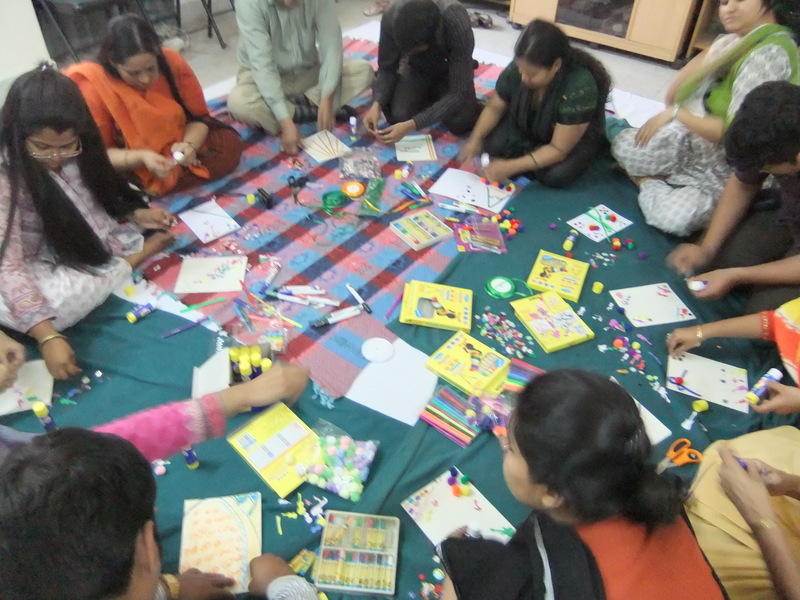 Here participants create their own journals for the workshop using collage material. Once the process began, there was no stopping. Participants felt very at home cutting, pasting, gluing and drawing! to experience art that was created. We also did some work on grounding ourselves when integrating challenging, stressful material. In this picture, two participants are using the “Heart sandwich” as a way to help a person access emotions and to feel supported and grounded. Other techniques included breathing , meditation and visualizations. Over all, the experience was truly one of stress reduction! 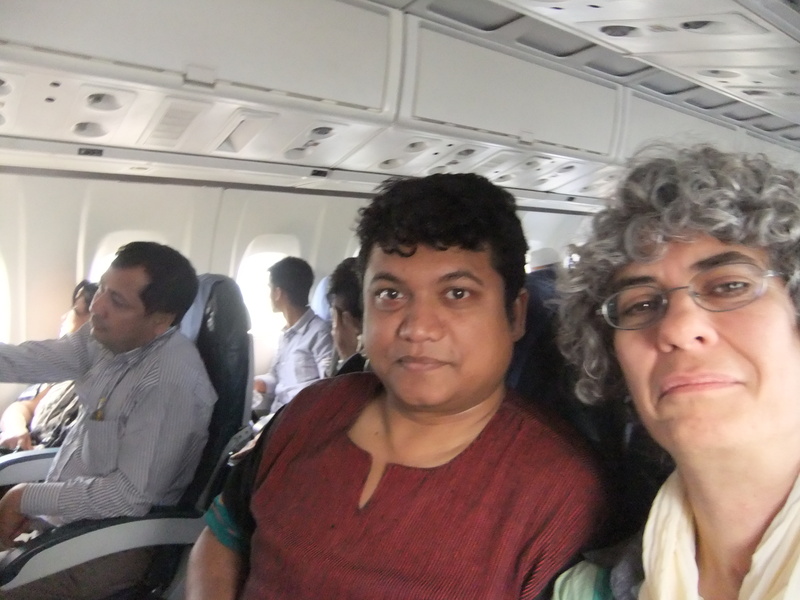 Including for me as I was 2 hours late for the second day, due to a meeting to help find support for the Bangladesh Therapeutic Theatre Institute which organized this trip. It was important for both Reza and I (who was with me) to breathe and create art in order to be able to integrate back into the class!! 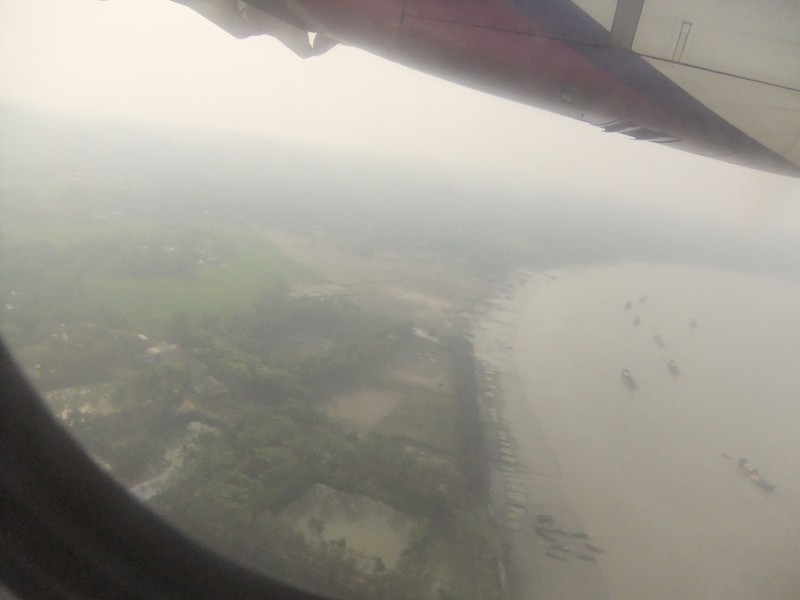 Then, onto Chittagong, a port city on the Bay of Bengal. 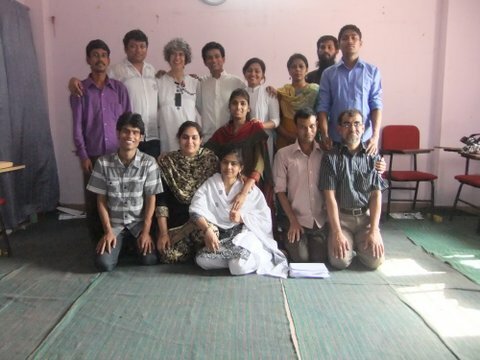 Thus began 3 days of team building and training of the 15 people who would then go to Mirsarai. First though was the Unite Theatre for Social Action 15th year celebration. I received an appreciation for my work with them in the last 10 years. We began with an ambitious 3 day training called “Developing Empathy using Playback Theatre” This actually also included understanding trauma work, and outlining the ways in which we were to use Playback Theatre to understand and work with the issue of bullying. We knew that in the 8 months since the accident (July 27, 2011) in which an open back truck carrying 45 students coming from a futball tournament swerved into a ditch, there was an increase in bullying behavior in both the primary and high schools. We know that there was tremendous community wide grief. On a previous trip in October, Mark Wentworth and Dynamic Theatre worked with this community, and I expected that there would still be a fair amount of grief work still needing to be done. In 2 assessment generating trips that Reza and a small team made before March, it wasdecided that the over all focus would be on offering support to families that lost children on an individual level, and to do an anti bullying campaign in the schools. Therefore the team needed to be able to cope with and handle very sensitive material, and be able to support people who (most likely) still be in deep grief. 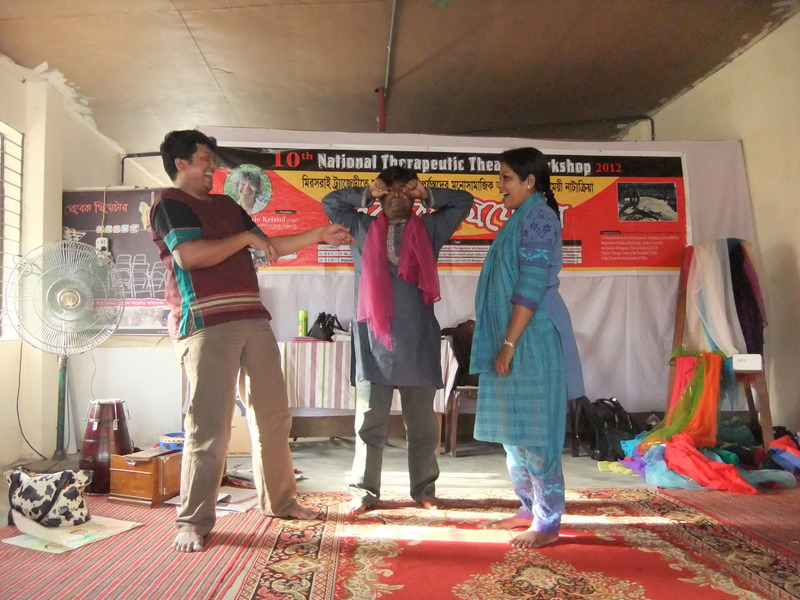 This was also a time for me to assess the groups knowledge and abilities around using Playback Theatre and other drama based skills that we would use in Mirsarai. There was a lot to hold. 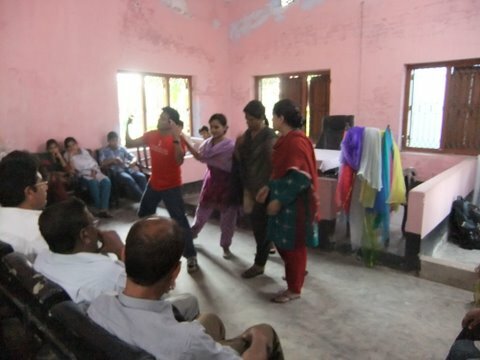 The training included 3 clinical psychologists (2 of whom would go to Mirsarai) UTSA staff that work using theatre in the slums of Chittagong, People who have trained with me in Playback and/or Psychodrama. It was multi generational (including the 18 month old daughter of 2 of our members!) and multi faceted. 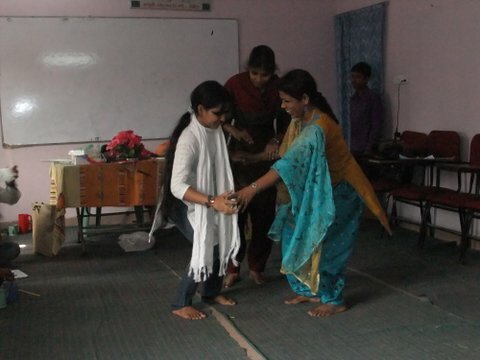 Included in the training was a day of personal work, team building and self care techniques to support each other and to use with community members in Mirsarai. This was vital, as many had not seen me in 3 years, since I was last here and yet I was supervising them- So team building and bringing me into the fold and to help each other connect with each other in a way that would bring support when the time really demanded it was crucial. 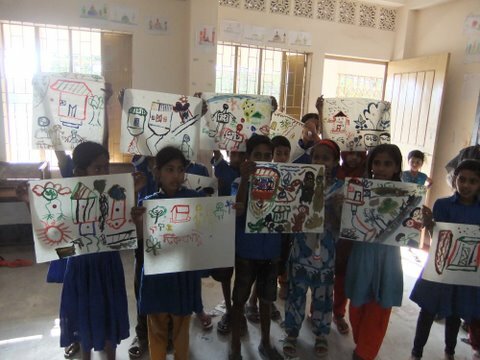 At one point, I offered a short presentation on Art Therapy to the community. 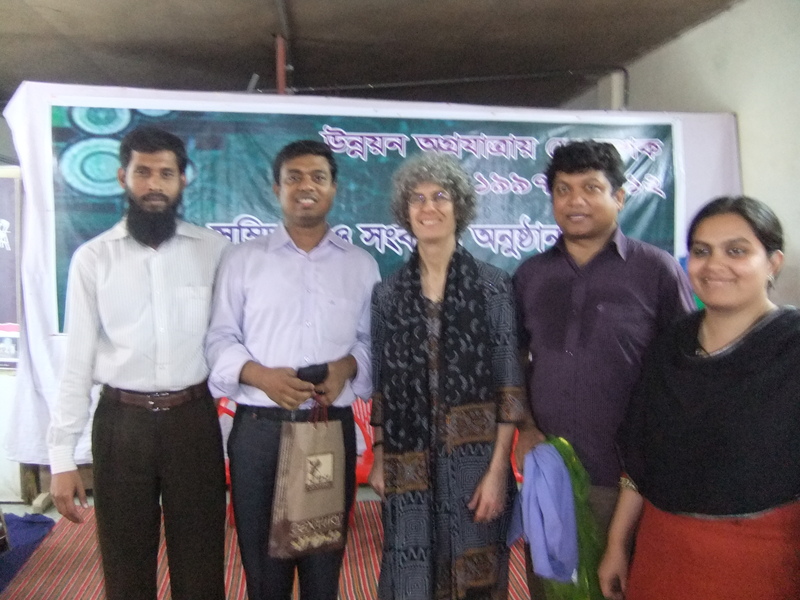 I met people from the disability community and the founder of the Autism Foundation of Chittagong. I ended up offering a presentation to the Autism Foundation another day after the training day ended. Here they are working on a drawing together ‘having a conversation on paper’. 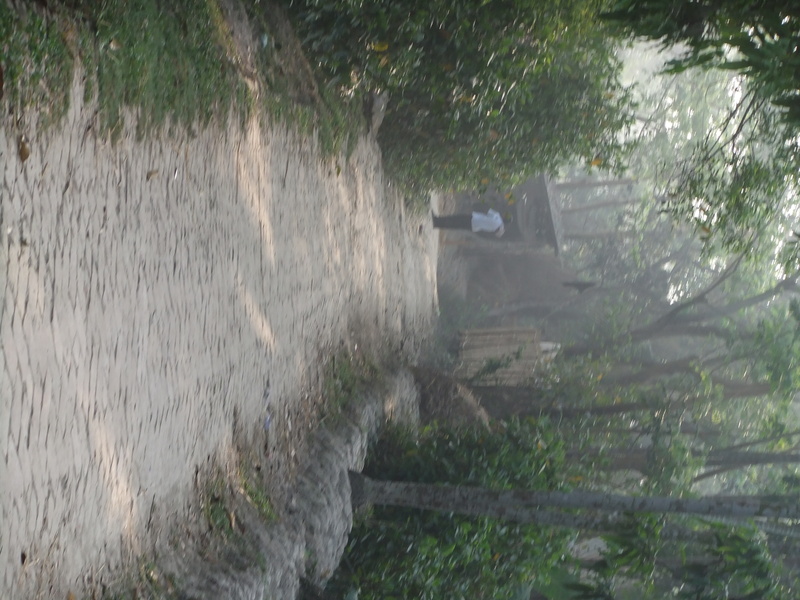 After 3 days we all traveled to the remote village of Mirsarai. Our first stop was to the site of the accident. An open truck, going to fast, swerved and went into a watery ditch. 45 students in the back were killed or drowned. It was a powerful memorial of remembrance. We all stood for a moment in silence, reflecting on the enormity of this experience as children and parents ourselves. Mirsarai is a little town that is made up of two distinct subsections. 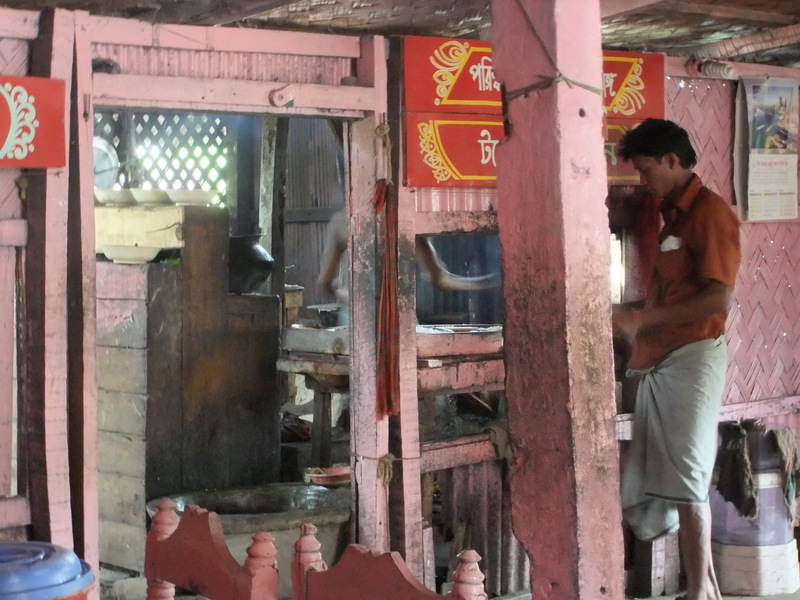 Socioeconomically mixed, the community was both Muslim and Hindu. We worked with people of all levels of economics and religion.There was a lot of cultural openings for me on this trip. 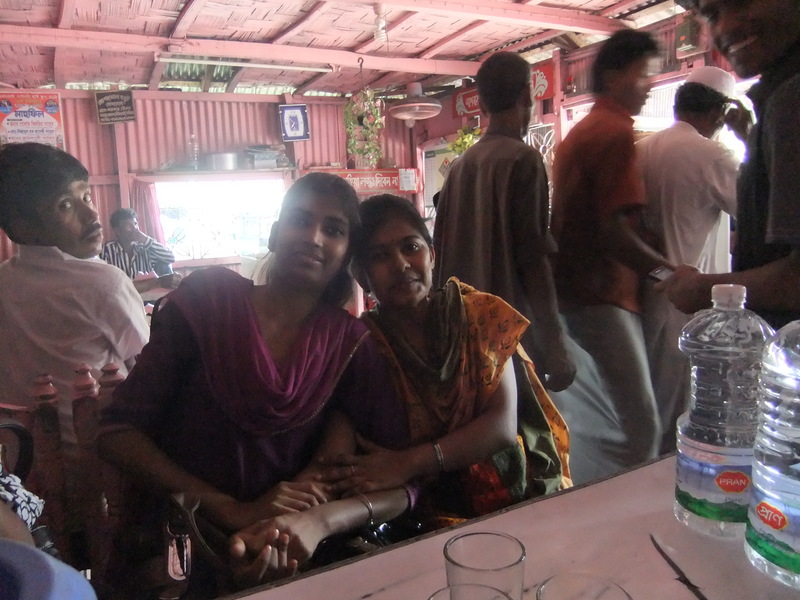 Cultural norms in general, were more conservative than in Chittagong. We worked in one area- Which poised a bit of an issue for those in the other township until they realized that we really had our hands full doing what we could in one town! Mostafa Kamal Jatra, the director of UTSA was instrumental in networking and speaking with different community leaders and helping to organize how everything would be run. Villagers bathing at the pond outside our house. One thing that I was very pleased about is that we convinced the journalists to stay away while we worked. This was vital for the integrity of our work and to create the confidential safety needed for any of the participants to share what they wanted. Given how fragile people were and how much trauma care was necessary , we were relieved . 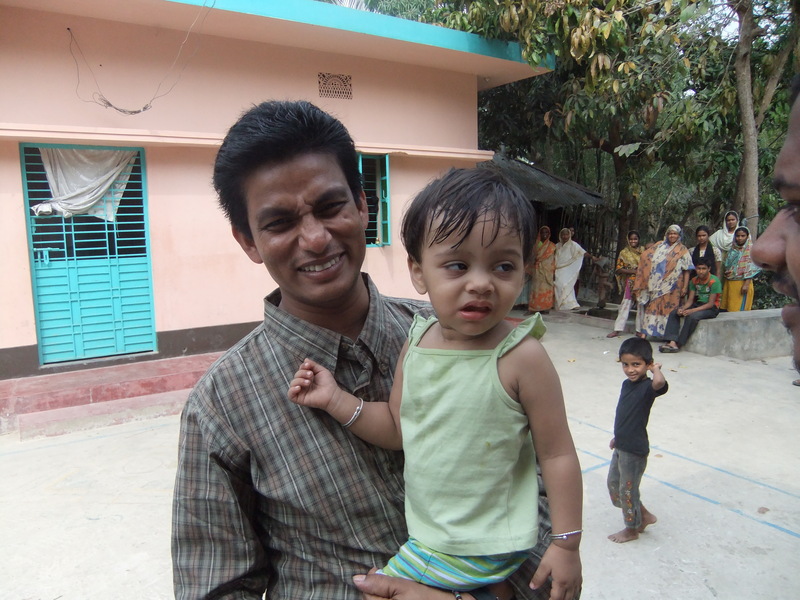 Munna and his daughter Obani- Our youngest team member. We stayed together in one house- This was wonderful as it allowed us easy access to each other. We had team meetings twice daily in my room to allow for daily debriefing and exploring ways to do things differently if need be and to be able to support each other. It was tremendously important and grounding. We ate at a small “hotel” another name for cafeteria. I have to be honest- I did not watch very carefully about how the food was made :~ Simply put-the “kitchen” is very different from what I am used to! The food though was very good. They were amazed that a “foreigner” would eat there (I really stood out every where I went- I was the only white person in the whole town! On the first day I had people just walking to my bedroom to look at me- So I had to lock my door when I was alone- It seemed to calm down after I started meeting people…) I also noticed that we were the only group there with women. Women do not go out to these hotels- its a male dominated space, but in our case they allowed it as they were feeding us 3 times a day. Stories were told in a variety of ways. Through Playback, through art and by listening and sharing in circles. From Day one we connected at the heart level and supported men and women to reconnect not only with their family and friends but themselves on a deep emotional level. 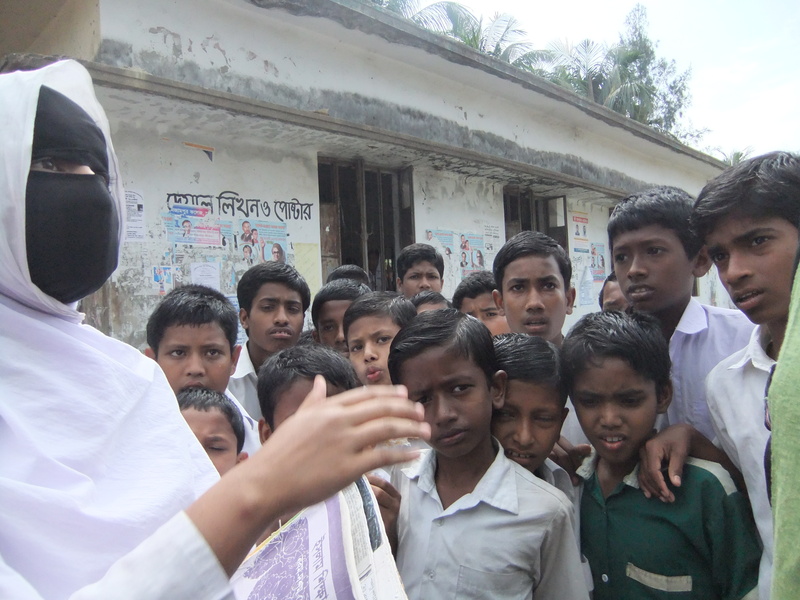 Not always easy- One thing that is prevalent in Bangladeshi culture is about how important boys are. The 45 students were all boys. Boys in this culture are the ones that often go to college, earn a living and care for their parents. Girls unfortunately do not carry as much clout. So one thing that was happening is that many of the girl siblings were left emotionally to mourn on their own and in some cases ignored. A goodly part of our work, was to support parents to open up more to their girl children to reconnect. We were heartened by seeing some of this occur. One of our main missions was to offer an anti bullying program to the schools. 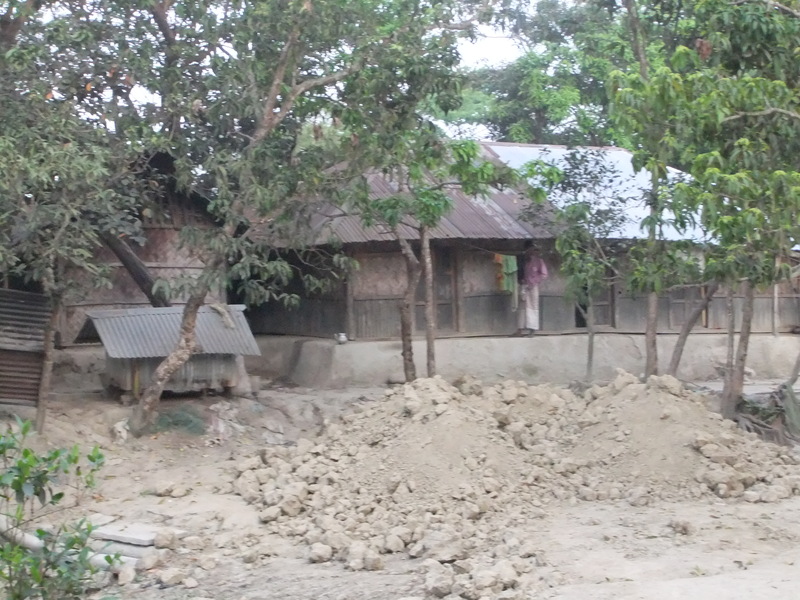 We worked in the 4rth standard and third standard classrooms. Each class had about 80 students!!!! We split the team up in half to do this. On day one , and introduced the issue of bullying. 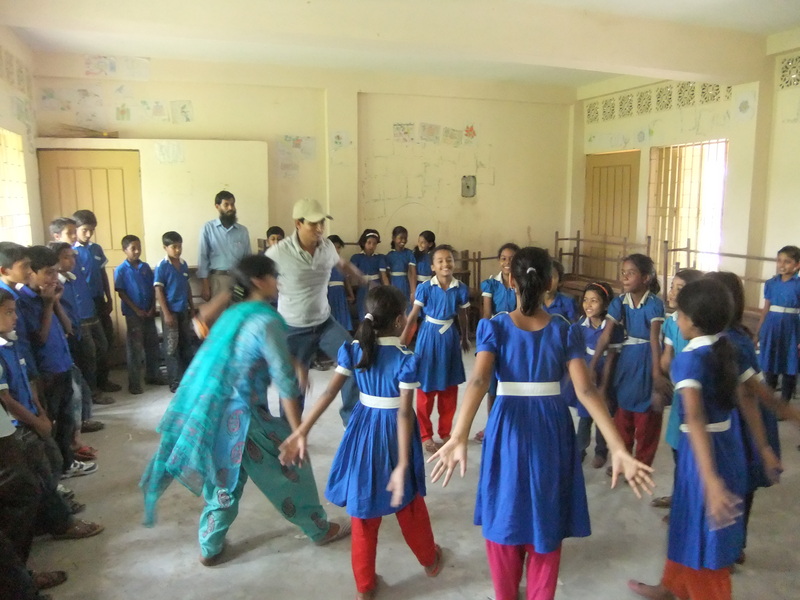 Through game playing exercises, and theatre games we did community and team building work with the children. We did role plays and other theatre methods including sociodrama and Playback and Forum theatre based work in which the kids told us what and how they wanted to see a bullying scene end differently that would support the victim. We created art and and we did some Playback to support all the feelings. 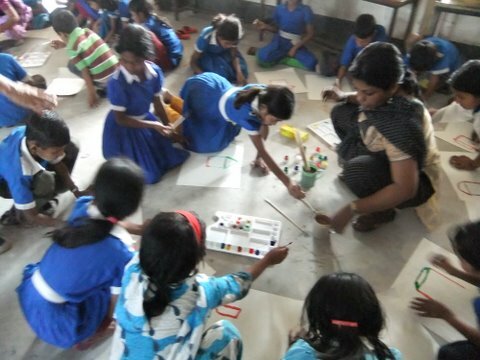 Amidst moderate chaos, the children learned different ways to listen to each other and respect each other. By the third day when they had created posters for the school, all the children knew at least 3 ways to prevent bullying and to stop it when they see it happening and had a way to process the feelings around the issue. 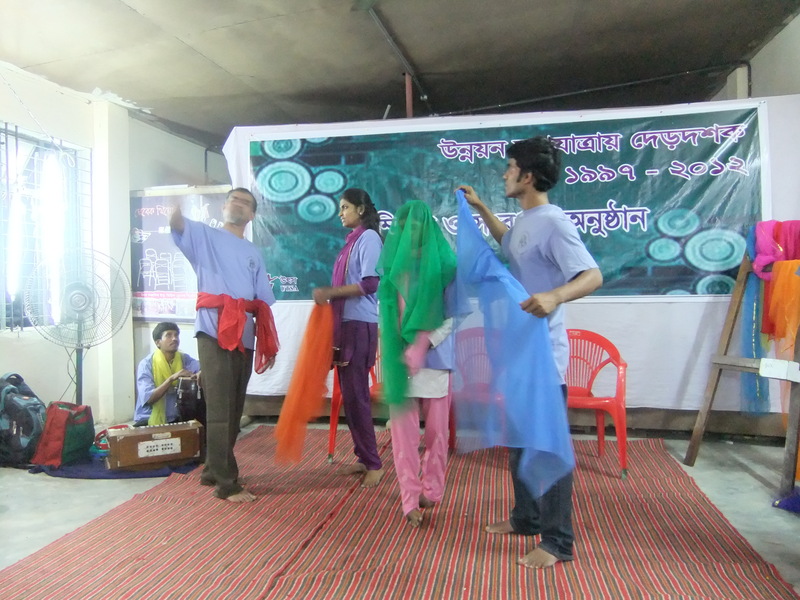 Our last major event was to offer a community Playback Theatre performance. Many of the families we visited over the 3 days came as well as many community leaders. It was poignant and touching to see how people had made significant shifts in some cases from not wanting to engage to engaging and participating. It was deeply moving and very powerful. One story told by a father that had lost both his children, talked about how he felt differently than he had before we came. That he was able to process things in a different way now about his children’s’ deaths and his own life. Watching the ending performance. 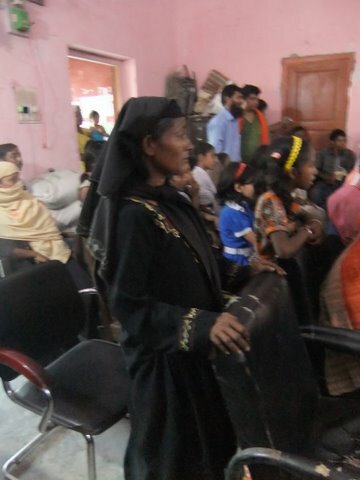 This woman we worked with- could not stay seated. She was pulled by the trance of personal stories being made into beautiful art. 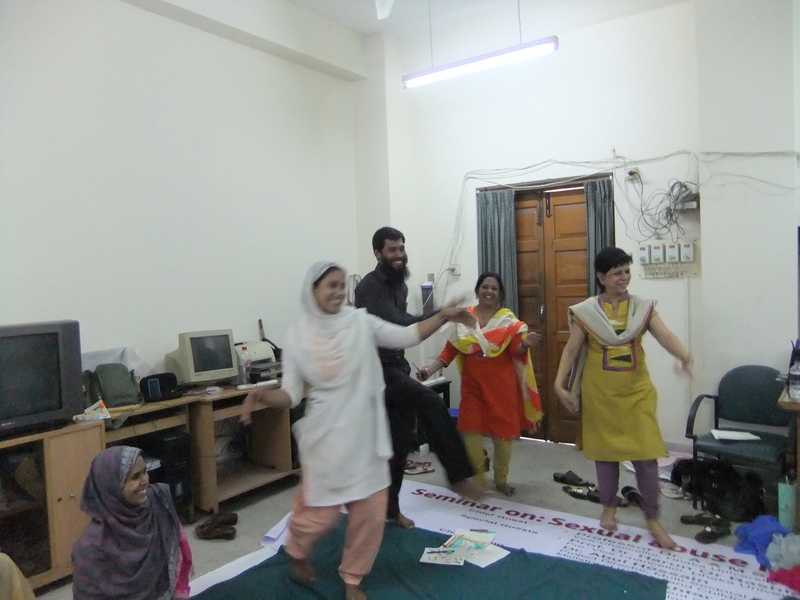 That was the end of our work in Mirsarai, but not the end for our group- The next day, we spent the day debriefing the experience- through Playback, art and movement, as well as sharing- What worked, what was challenging, and what could have been different. Like any project, there are bugs to be worked out. 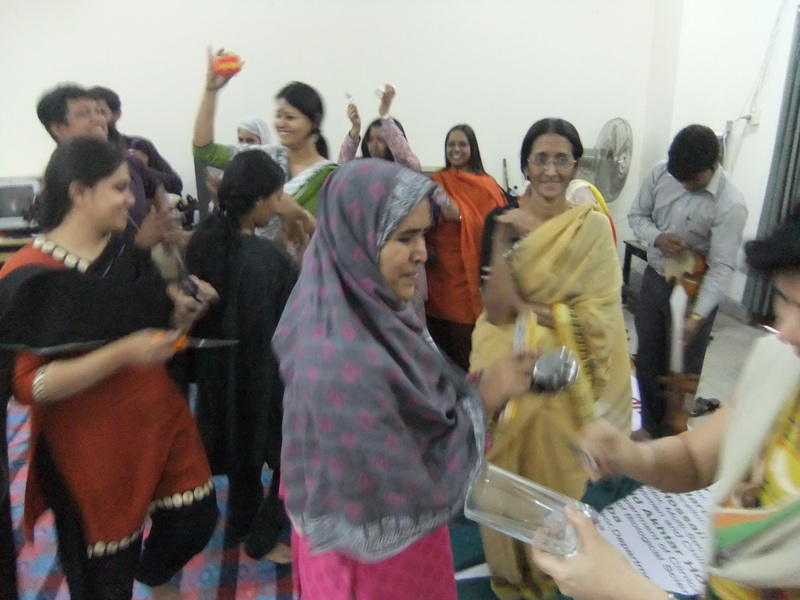 One huge hurdle for future work is having people train more in counseling skills- to continue working on their Playback skills, to be able to embrace the challenging stories, and to keep working as a team to keep developing them selves as a group- Challenging due to their living in different geographic locations. Over all, I feel that the experience was positive and that we made a deep and lasting impression. Leaders in the community have invited the team to come back. Of course the next big hurdle for the village is July 27th. Anniversaries can be so hard…. Poverty exists in India. Everywhere one goes are people in rags, dirty, unshaven and seemingly in high distress. 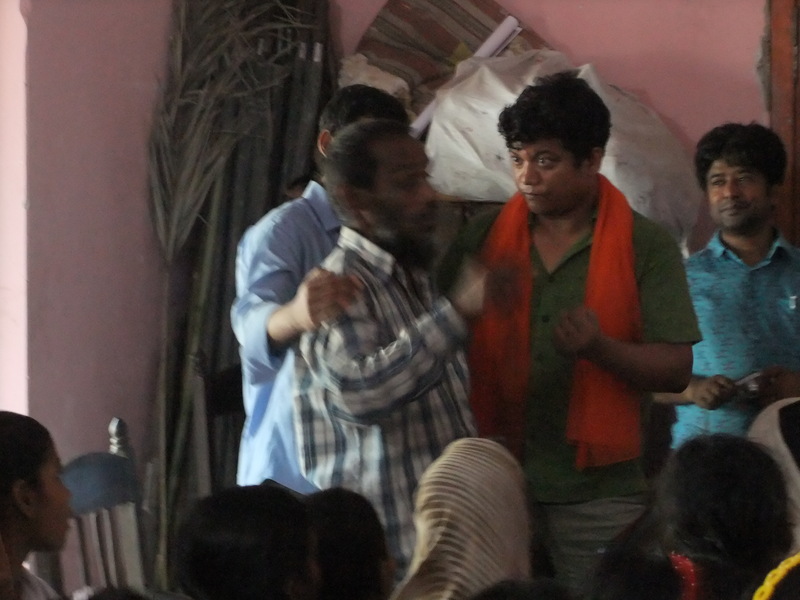 Hands pushing under me – hands to mouths, imploring me that they are hungry and in need of food. Hands, some with babies, telling me that they need food, money. However, poverty might not exist in the way that one thinks. After conversations with Magdalene and others, I am becoming aware that what I experience as poverty, is not necessarily how the Indians view it. Poor people work, and many work very hard. So how does one define what poverty is? Even caste does not necessarily define poverty. So what is it? There are people begging on the streets, who in fact have homes and money in the bank. Begging is a job for them. The beggars have unions and ways to stay in touch (i.e. churches and meetings). Unlike Bangladesh, one does not see children (many anyway) begging on the streets. It is compulsory for children to be in school until age 15. When we see children on the street begging, out of school, we know that the family is ignoring this important law of the land. There are moments we are approached by a beggar, dressed in rags and looking for a handout. One is not to give necessarily, as the beggars, if nothing else, have shelters and homes they can go to. Food and clothes are generously given by differing charities. Rags are (often) a uniform beggars put on. One of my students noted, that being generous was difficult, when she witnesses beggars at the end of a train line, in the last car, taking off their rags and begging clothes, so that they can leave and go home. So it is complicated. Is there poverty? Yes I see many people sleeping in the streets, near trash- living in less than sanitary homes.. But one needs to see the way in which this system is working before making judgments. A word about pictures. I have not taken many photographs of people- especially poor people – as that makes them into objects. I have asked a few if I could take a photograph, and been rejected. I am increasingly sensitive to the way people feel about being photographed. 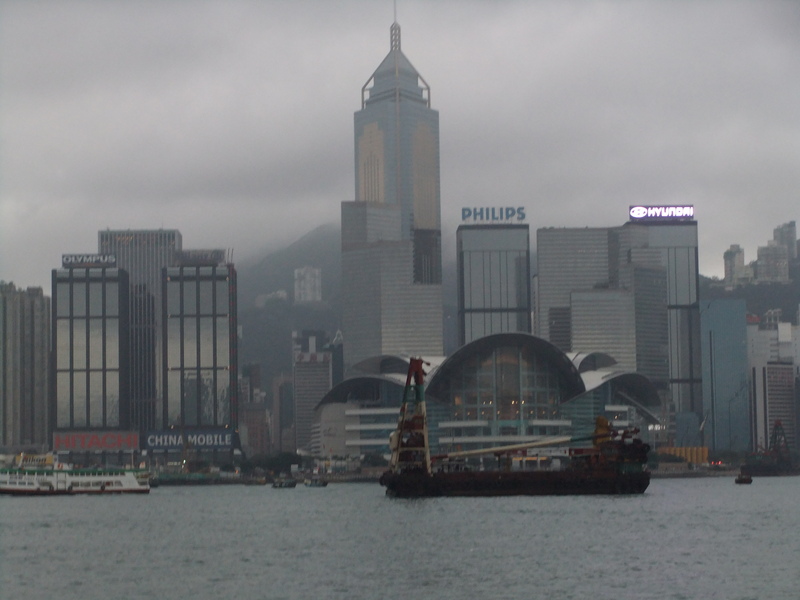 As a foreigner, I need to use my camera wisely, and not make people into something they are not. I encourage you to use your imaginations as you read my writing. To the best of your ability, put yourself into the shoes of the poor people, and others, about whom I write. Due to unexplainable internet issues, I have not been able to pst my latest blogs (one on poverty, and another on a 5 day training last week working with staff from World Vision, an organization that works with Children) right now I am renting a computer at a hotel. In brief- My husband flew in on Saturday, and has been having his own adventures- I have run a 5 day training followed by two 1/2 day trainings over the weekend- I start a new training this afternoon working with students at the Women’s Christian College, and later this week, a 2 full day training with students in the social work department. Michel and I then take a train to Bangalore. I will be working with a playback theatre company there. We have been walking, a lot. Seeing a lot- digesting much. With luck, the internet will be up soon and I can post my observations. It is often like this. One can not be too dependent on the infrastructure- it easily collapses.